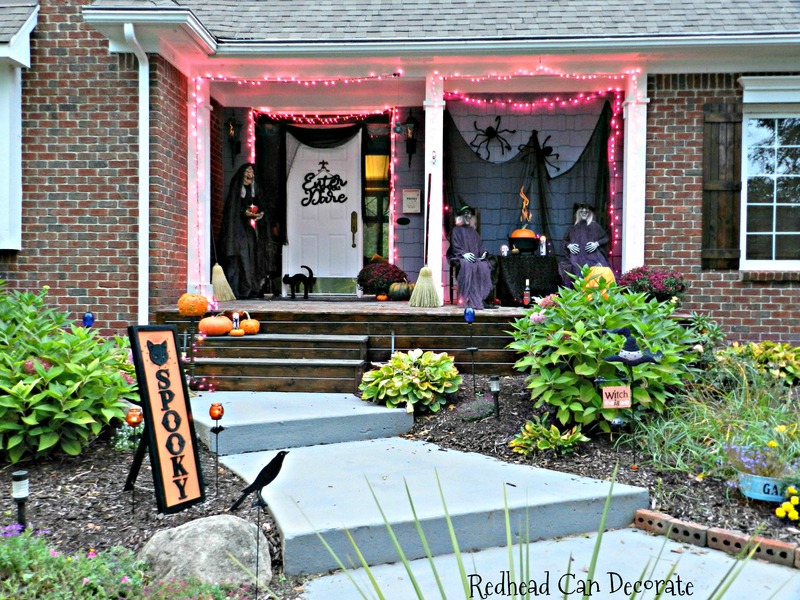 I never thought of our porch as a “stage”, but after this “Spooky Witch Halloween Porch” we created I’m beginning to see it. 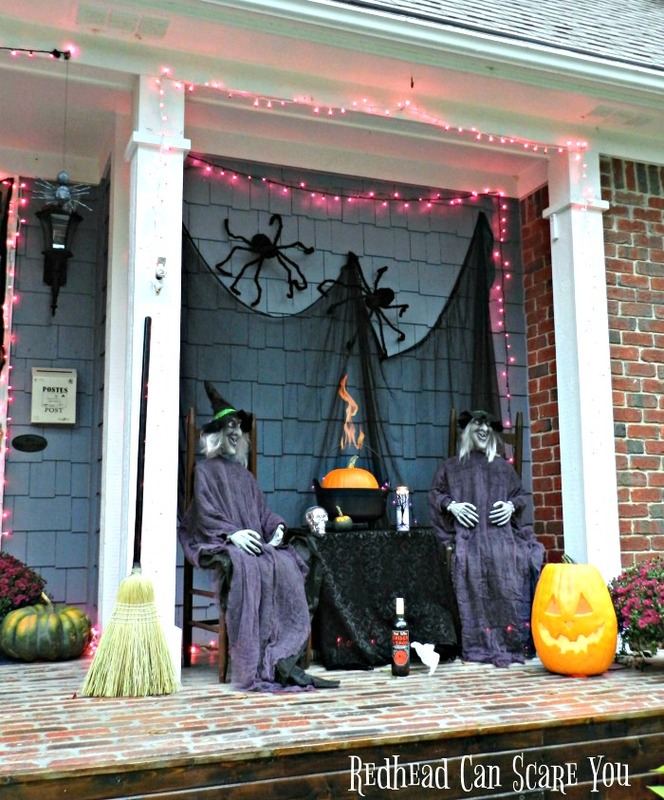 I could have the kids set up a booth out front by our mailbox and sell “drive-bys” for $2! The driveway is perfect for the show because it’s a circle, so folks could enter on the one side, and exit out the other. Okay…you know I’m joking, but honestly when we were setting this up our neighbors pulled up and told me to tell my husband not to park in his usual spot so they could drive all the way through the circle and check it out when they get home at night. Oh, once I heard that, I had to make it good. My teen son helped me put all of this together. 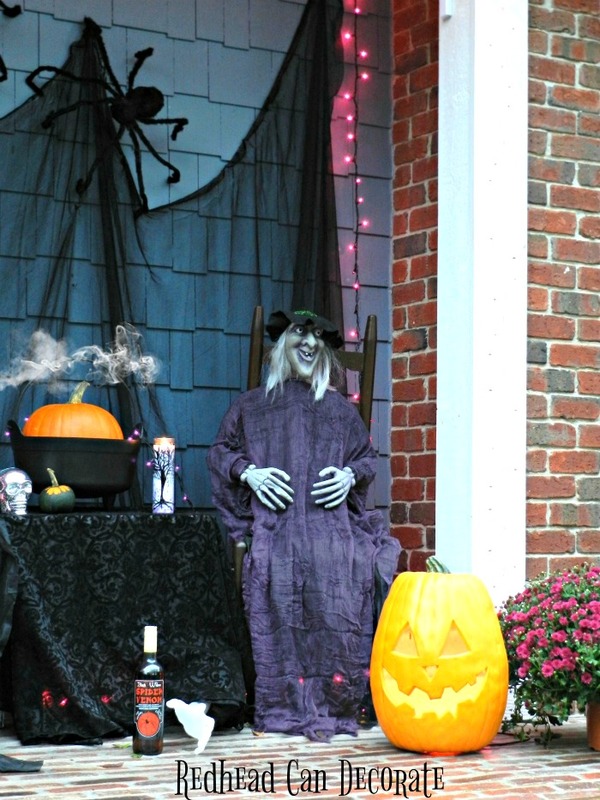 I hope you enjoy our “Spooky Witch Halloween Porch” tour…complete with free apples and spider venom pumpkin stew . 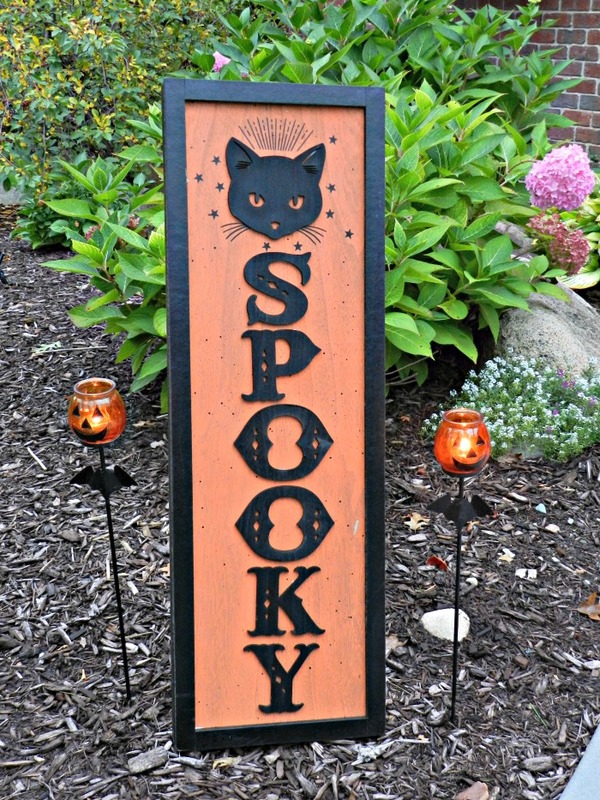 “Spooky” sign from Joann’s & candles are very old. 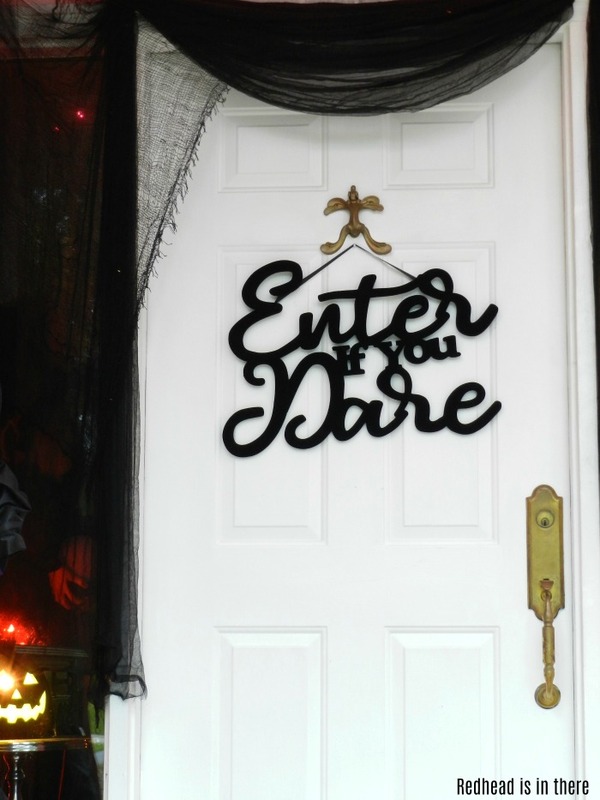 Enter if You Dare sign from Joann’s, & black web fabric also from Joann’s. I hope the witch didn’t scare you away. I promise I am not “into” witches on a daily basis…but once in a lifetime is fun. Trust me. Isn’t she just adorable? Unfortunately, I couldn’t find the exact version for you, but I did find a similar style here: WITCH. She is hung with a wire from the ceiling that my husband screwed into her skull. The lights and black web fabric was easily hung with a few small nails which really creates a nice back drop. It appears that the table with the pumpkin is outside, but I actually placed that in front of the sidelight window inside our foyer. After all, didn’t you like to look inside sidelight windows for the candy when you were little? I’m hoping the kids will want to do that. Oh, and I ordered the BROOM(S) and spray painted the handles black to make them look legit. 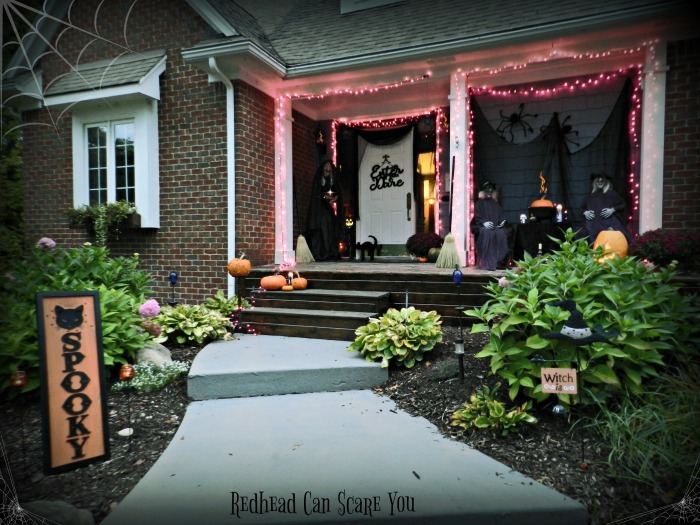 You know…like the witches just flew in on them. I figured if I’m going to do this, I better do it up right because our kids are getting really old. Luckily they both still LOVE Halloween. I can’t imagine where they get that from. 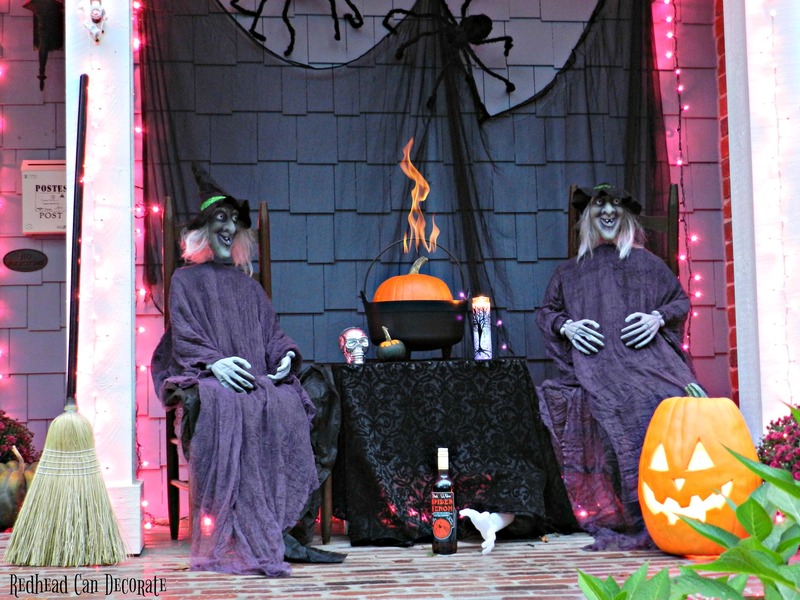 I couldn’t resist ordering the Twin Witches and setting up their little spider venom pumpkin stew station was so much fun. The more I thought about it, the cuter it became with just things I already had. The cauldron is usually my candy bowl, and was perfect for the “stew”. The spiders are about 15 years old believe it or not, but I found more here: SPIDERS. I’m note sure who the witches have under their table, but he needs some sun. 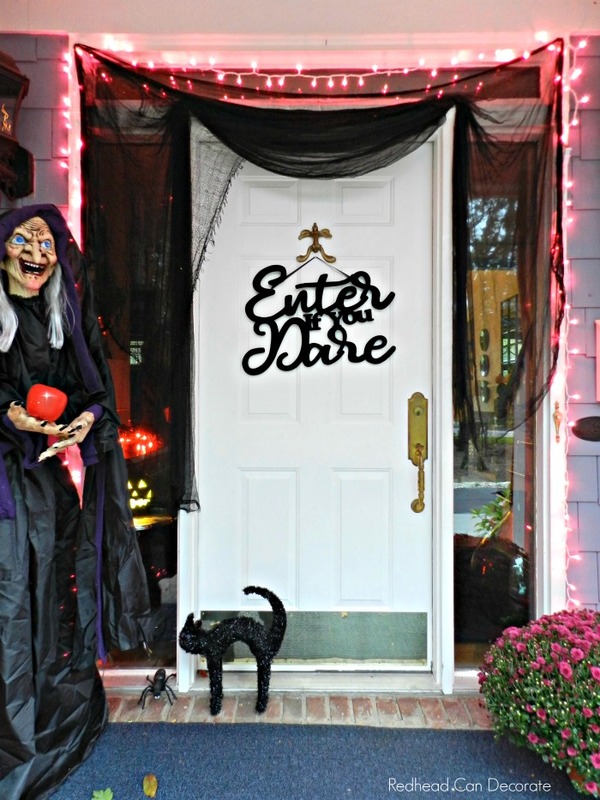 Wicked sign is from the dollar store (can’t get wet). I hope I made you cackle a little. Now it’s time for me to take a break with my new friends and go get me some spider venom juice. 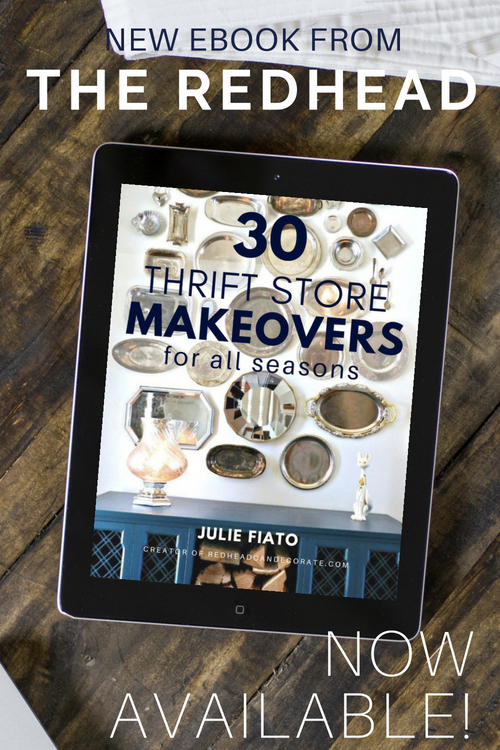 Just in case you missed it last week, my new e-book 30 Thrift Store Makeovers for All Seasons is now available HERE. So you! I love the silly spookiness without gore! Love, love, love this porch!! 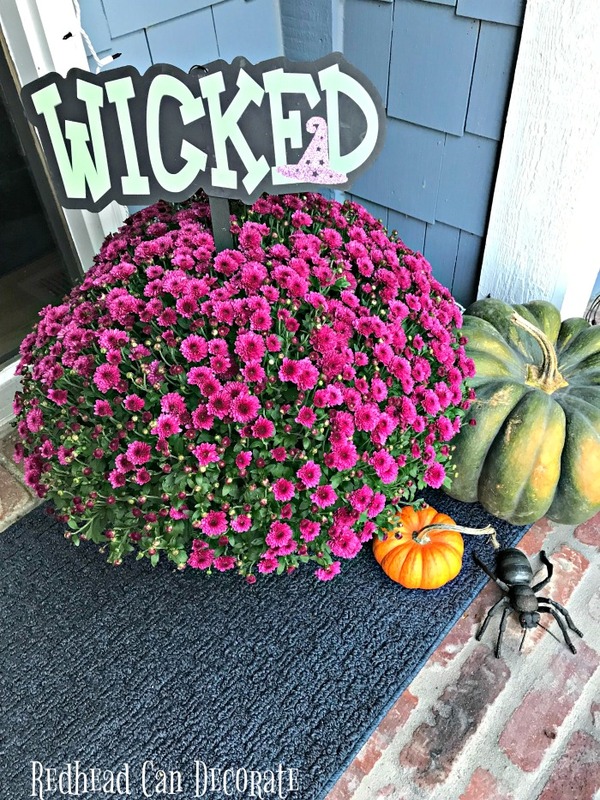 !❤️ As a kindred spirit for Halloween, AND a fellow Michigander, I say wicked front porch!???????????? I too have older kids and they are the same way! I’m so happy our kids share that with us. 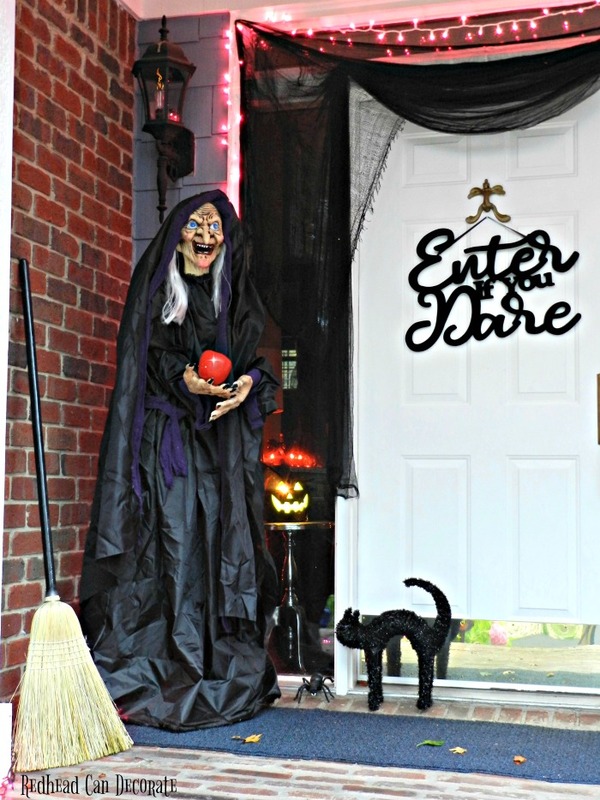 You and your family should make a trip to Northville some weekend and check out the town’s MANY skeletons! You would love it! The town is really cute with some great stores and eateries and there is a great cider mill as well! Skeletons??? Ooooooo…now you got me researching. I will check it out. We go to Romeo area for cider, but I’m ready to go again, lol! Oh my word, this is totally amazing. I love it. Absolutely LOVE it!! The witches are fantastic!! I originally wanted 3 different witches, then the twin idea came. Lol. Thanks, Debbie!